Platypus' evolutionary roots are highly controversial. Platypuses, along with four species of echidna, are species of monotremes, defined by their dual nature of having mammary glands and egg-laying capabilities. Monotremes are considered primitive mammals, and platypuses are the remaining members of the family Ornithorhynchidae. Monotremes are position at the earliest offshoot of mammalian lineage albeit their phylogenetic position has been controversial. 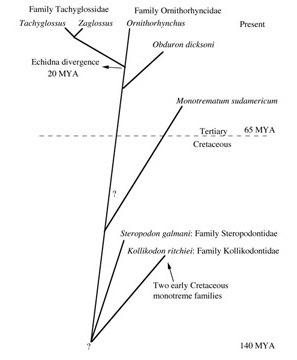 Some believe they share a common ancestor with marsupials while other believe that monotremes are more evolutionarily related to the subclass Theria (Figure 1; Grutzner 2004). Current efforts are underway to sequence the platypus genome, which will divulge details of the evolutionary roots of animals. 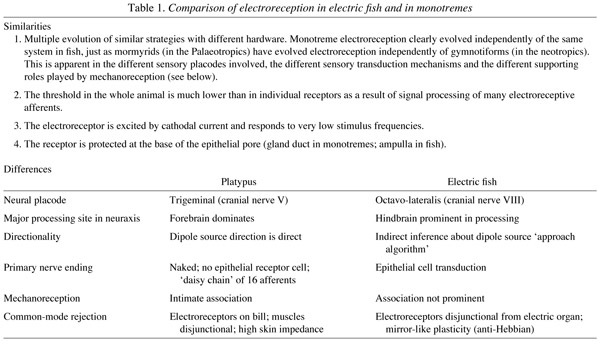 Nonetheless, electroreception still remains a characteristic solely found in monotremes. 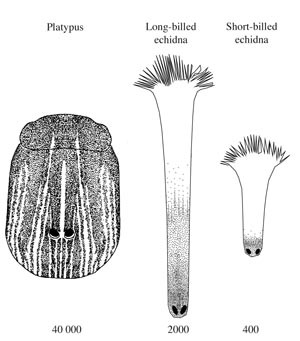 The platypus, long-billed echidna (Zaglossus bruijnii), and short-billed echidna (Tachyglossus aculeatus) are three types of monotremes that have shown a degree of electroreception, either through physiological observation of electroreceptors on the bill skin or through behavioral demonstrations (Figure 2; Pettigrew 1999). In addition to platypuses, electroreceptive afferents are apparent in the bill/beak of echidnas. Electroreceptive echidnas and platypuses have three types of bill surface receptors: a push-rod mechanoreceptor containing sensory neurons, serous electroreceptors, and larger mucous electroreceptors. Mechanoreceptors are sensory organs that sense mechanical stimulation such as touch and pressure and relay the information to the central nervous system. On the other hand, electroreceptors allows the platypus to sense electric fields generated by objects in its environment (Sherwood 2004). Although platypus bills have up to 40,000 electroreceptors, those of long-billed and short-billed echidnas have 2,000 and 400, respectively. This suggests that the electroreceptors on the two types of echidnas, whose habitat ranges from tropical forests to alpine forests to deserts, are evolutionarily being selected against because such sensing ability is only useful in semi-aquatic environments (Pettigrew 1999). The similarities between electric fish and monotremes are thought to be as a result of similar evolutionary pressures in different animals. Both organisms exhibit signal processing capabilities, but obvious differences are evident in the nervous system hardware, such as the nerves that supply the sensory stimuli and processing center in the brain, as outlined above. Furthermore, platypuses are able to exhibit the ability to move directly to the electric source whereas fish may only move laterally in three-dimensional space. The reasons behind the platypus' directionality is addressed in the mechanism section.